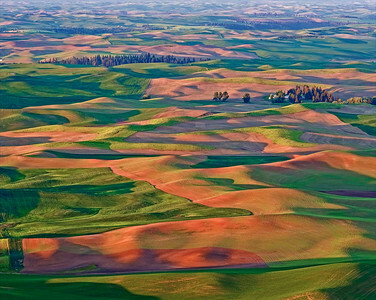 "Steptoe Sunrise" A fiery red sunrise, the product of many harvesters' dust plumes, washes the rolling hills of the Palouse as seen from Steptoe Butte. "Prairie Sentinel" Near the town of Colfax in Eastern Washington, an old windmill is silhouetted by a chaotic sky and a fabulous sunset. "Palouse Pioneer" An exquisite sky and the gently rolling hills of the Palouse provide the perfect backdrop for this old barn near the town of Colfax. Though showing its age, it's been given a relatively new shake roof and spared the indignity of the rusted corrugated ones so often seen. 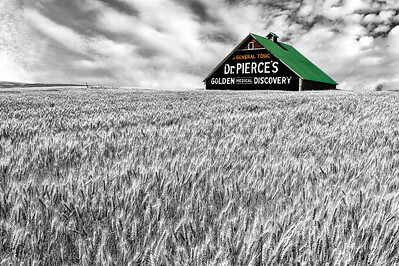 "Dr. Pierce's Tonic" Near the town of Waterville in Eastern Washington, this class old barn recalls the original "pop-up" ads that once graced many a rural building.